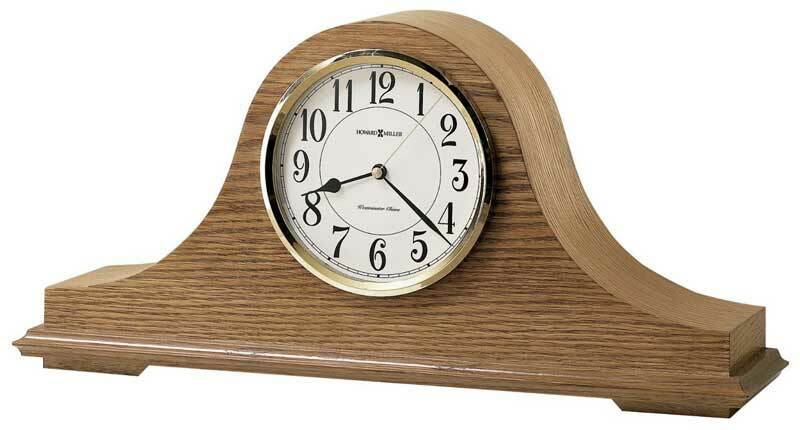 The Howard Miller Nicholas 635-100 is a traditional tambour (sloping) mantel clock in an oak finish. The off-white dial offers a convex glass crystal, polished brass finished bezel, black Arabic numerals and brass second hand. Finished in Golden Oak on select hardwoods and veneers. 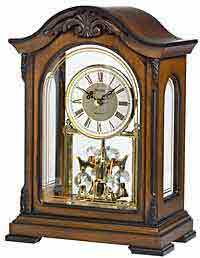 Quartz, battery operated movement will play Westminster chime melody on the hour and also count the hour. Volume control and a chime on / off switch. Chimes will always silence at night with the automatic nighttime chime shut-off feature. Quartz, battery operated movement is powered by 3 AA batteries. Size: Height 8 1/2", Width 17 3/4", Depth 4 3/4". 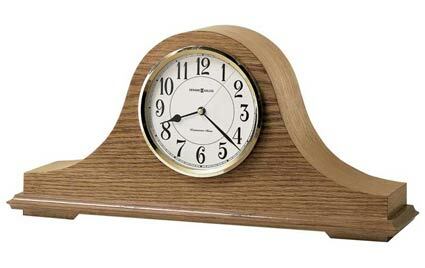 Clocks for sale at The Clock Depot including the 635-100 at discount prices.